The Ativ Tab is a good-looking gadget with quality build and premium feel. It takes a lot of design cues from the Galaxy Note 10.1, but somehow manages to look way better. The minimalist design suits this tablet quite well. The slate is entirely made of plastic, which may sound questionable considering the magnesium case of the Microsoft Surface, but there's nothing about the build and finish to raise concern. The back of the Ativ Tab is nice to touch and has a brushed aluminum look. 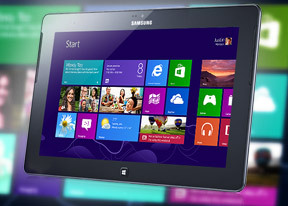 The Samsung Ativ Tab is built around a 10.1" PLS LCD display of the reasonable 1366 x 768 pixel resolution. The screen is very bright at 400-nits and boasts wide viewing angles. The image quality is above average with vivid colors and reasonably deep blacks (we're saving our usual screen tests for a retail unit). Pixel density is nothing to be excited about (155ppi), but considering tablets like the Ativ Tab are viewed at a bigger distance than phones, it's not much of an issue. The Windows RT platform mandates a single hardware control - the classic Windows Start button. On the Ativ Tab it is centrally placed below the display. In our pre-release unit, the Start button felt a little flimsy, but this will hopefully be sorted before the Ativ Tab launches. Overall, the tablet feels extra solid, no rattle and creaks even when we tried to twist it. The front-facing camera is located above the display, along with all the sensors. In the left corner, there's a status LED. There are two front-facing speakers on either side of the screen. We found this location to much better suit gaming and movie watching than the sides or the back of the slate. Due to the position of the speakers in the upper half of the tablet, you're not likely to cover them with your palms. At the top of the Samsung Ativ Tab (in landscape) are all the buttons and ports (except the docking port). There we find the 3.5mm audio jack along with a lock/power button and the volume rocker. There's a full-size USB 2.0 port and a microHDMI port, both sharing a plastic lid. Lastly, there's a microSD card slot which is also covered. The port for connecting an optional keyboard, complete with a touchpad, is located at the bottom. There's a hinge hole on each side to firmly secure the keyboard. This optional peripheral is something to consider, if you are going to do a lot of typing. Alternatively, you choose the money-saving option of a wireless Bluetooth keyboard. A mouse can be connected too via the USB 2.0 port. The Samsung Ativ Tab uses a proprietary connector for charging only, which is placed at the bottom left. At the back of the Ativ Tab 10.1 we find a 5MP camera lens with an LED flash next to it. The camera is quite capable of shooting the occasional photos and HD videos. The Samsung Ativ Tab gets its juice from a beefy 8,200mAh Li-Ion battery. Although there are no official battery life quotes yet, Microsoft promise to impress users with longevity thanks to the OS efficient resource managing. We'll be doing our own battery tests once we obtain a retail-ready unit. The plastic used on the outside is the glossy variety rather than the matte finish on recent Samsung tablets. Although it's very nice to the touch, it takes fingerprints easily. Operating the tablet with one hand, while holding it with the other is possible, but sooner or later you are going to feel the Ativ Tab's weight of 570 grams. Nevertheless, holding it is extremely satisfying thanks to solid build and the 8.9mm thickness. The Samsung Ativ Tab will have an optional keyboard with a touchpad. A stylus is being mentioned too.